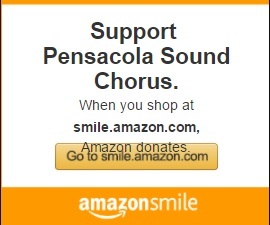 Pensacola Sound Chorus is affiliated with Sweet Adelines International, a 501 (c) (3) music education organization that educates its 30,000 members worldwide to sing four-part a cappella barbershop harmony. Its goal is to be a musical asset to the community, to provide professional entertainment, and to teach the unique American art form of barbershop style singing. The chorus is part of the Coastal Harmony Region 9, which includes the state of Florida, the lower portion of Georgia and a small part of South Carolina. The chorus rehearses every Tuesday evening at Heights Baptist Church, 600 Pickens Ave., Pensacola. Rehearsals start at 6:00pm with registration beginning at 6:15pm. Visitors are always welcome. Please park your vehicle on the North side of the church.